What is Wells of Love? 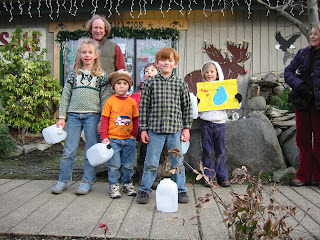 Salmonberry School’s Primary Class recently capped off an integrated thematic study of water and North African cultures with an inspiring service learning project called “A Walk for Water.” The ten 5-7 year olds walked a total of 76 half-mile loops through Eastsound to raise funds for a remote North African community in need of help to drill wells for their community. The most determined of the young walkers completed five miles each. It all started in the fall with the class studying water. They looked at water properties, water cycle, and all kinds of scientific investigations. Quickly this led to explorations of water resource issues locally and around the world. In December the class began an in depth cross cultural study of the Saharan region and particularly the country of Niger, generally considered the poorest, and driest country on earth. In this phase of the project the class cooked and ate food from North Africa, looked at and analyzed photographs, read Peace Corps workers’ journals, listened to and played music, looked at clothing, language, housing and games from the region, and even touched on language, folk tales and religion in North Africa. I believe it was a very respectful and rich cultural study. The children got a full sense of what it might be like to live in the Saharan Region. 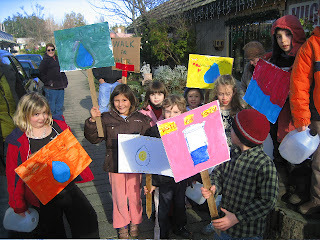 Salmonberry School then connected with the Amman-Imman (Water is Life) Project, a collaborative effort of educators and children across the country committed to helping raise money and awareness through service learning projects in their communities. The project is targeting a region called the Azawak Valley located mostly in the west part of Niger and extending into Mali. It is an area roughly the size of Florida with 500,000 people and virtually no water for nine months each year. In this community people, often young children, have to walk huge distances to find muddy water sources to bring back meager supplies of water for their families for drinking, cooking, bathing, watering stock and irrigating gardens. Sometimes these children journey up to thirty miles in search of water. 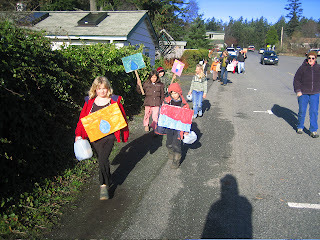 With this figure in mind, the Salmonberry students set a goal of a cumulative 30 mile walk through Eastsound. And Tuesday, January 15, it became a reality. Students gathered pledges from friends and family members. Then they walked for three hours, collecting tokens for each half-mile they completed. All together the class collected 76 tokens representing 38 miles walked cumulatively. These efforts will result in a sizable amount of money to contribute to the Amman-Imman Project. It also resulted in some amazing and unexpected learning on the part of the kids. The students wrote beautiful heartfelt letters and cards that will be included with the check, which will be mailed to the Amman-Imman Project. Amman Imman is dedicated to empowering and preserving Africa's most vulnerable indigenous peoples, and engaging students worldwide as socially conscious leaders. Like to talk to AI? Well, we would love to hear from you! Make a Donation: Help Amman Imman bring water and hope! AWFW 2015 Update: More Musical Guests and Activities for All Ages! The Amman Imman Wells of Love program engages students as active partners, instilling a global consciousness and a humanitarian spirit in today’s youth, and tomorrow’s leaders.